Letters came off a Sweat Shirt in the dryer. How do I fix it? It happens! You buy an adorable sweatshirt and when you wash it, the letters or decoration comes off in the laundry. It can really make you angry to have wasted your money on something you only wore once, or you can fix it so it will be better than new. The embellishments usually come off in the dryer because the heat softens the bond of a fusible that was used to apply the decoration. Odds are both the decoration and the fabric that the garment is made of were not washed before the embellishment was added to the garment. The finishes in the fabrics will stop the fusible from making good contact. The manufacturer relies totally on the fusing material and does not apply any stitching, then when the fusing starts to soften, the embellishment come off the garment. Turn the garment inside out so the embellishment is "protected" inside the garment. Use cool water to avoid heat from softening the fuse. 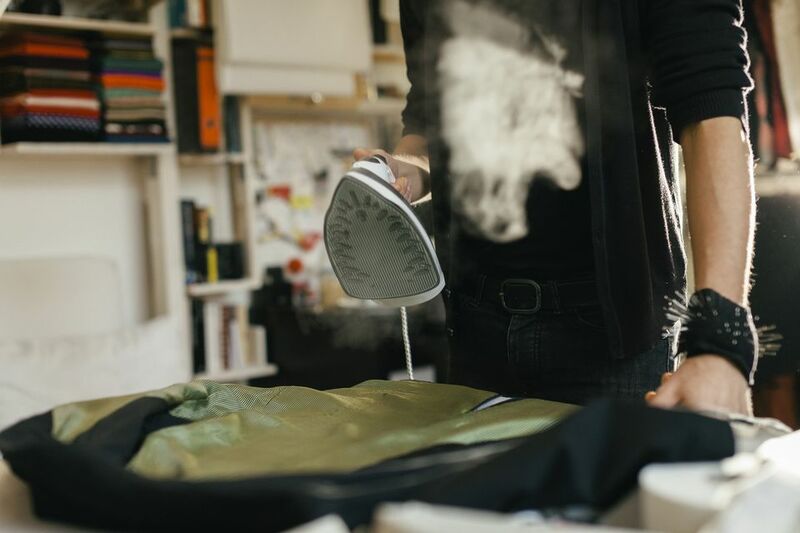 Use a low-temperature dryer or line dry the item to prevent heat from loosening the fusion. Use your iron to press the embellishment into place if edges come unattached. Allow the item to lay flat to cool. Fusible web - As much as your inclination might be to get a "heavy" fusible, using a heavy fusible will usually end up with a very stiff garment. Parchment Paper or backing paper from previously used webbing. Protect your ironing surface with a piece of parchment paper. Lay the applique or letters right side down on the parchment paper. Lay fusible web over the wrong side of the applique or letters. Cut the fusible web for a rough fit so you do not waste what you are not using on this project. Press the fusible web to the applique of letters following the manufacturer's instructions. Allow the fused item to cool. Trim away all excess so there is only fusible web on the back of the item that came off the item. 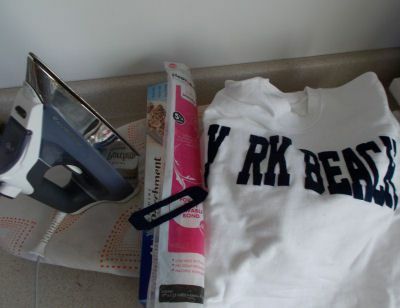 Lay the item of clothing out on a flat surface that you can iron on. If you need a larger area than an ironing board, protect a table or counter top with multiple layers of towels. Place the letters or design and arrange them exactly where you want them. Place a pressing cloth or parchment paper over top of the items being reattached, being sure not to move the items from the desired position. Carefully iron the items in place. Allow the item to cool before moving it to allow the fusible web to do it's job. There are numerous ways to secure an embellishment to a garment. Some embellishments will stay secure with just the fusible adhesive to hold them in place as long as you are very careful to follow the laundering tips that were offered in step one. Most lettering or embellishments are secured on the edges with a satin stitch. If you have never sewn a satin stitch, duplicate what you will be doing using scraps of fabric to practice sewing straight areas, curved areas and turning corners by pivoting with the sewing machine needle down. This practice time allows you to adjust the width and length of the zigzag stitch and find a guide which will work well to keep your stitching straight and even. I have also seen applique style letters and designs held in place with single lines of straight stitching on all edges of the applique. The trick to this is to keep the stitching evenly from the edge of the item on all edges. Many times this leads to a curled edge on the embellishment. The closer you sew to the edge the less design will be lost to the "curling" effect.